The bulk of the Arcadia Dunes-C.S. Mott Preserve trail system is Dry Hill Trails, a glacial moraine ridge that runs inland several miles from the Baldy Trails along Lake Michigan. South of the moraine are steep-forested back dunes and together they give the preserve a rugged interior, much to the delight of the mountain bikers who laid out the trail. 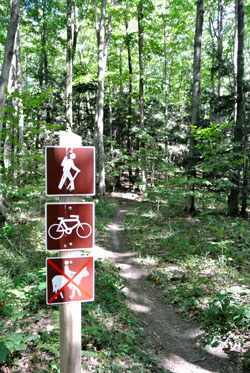 Although open to all trail users, Dry Hill was a collaboration between the Grand Traverse Regional Land Conservancy and the International Mountain Biking Association. The loop is classic single track, a flowing trail rated “intermediate” with quick rolling hills, numerous long uphill sections and naturally banked turns. The main trailhead is located on Saint Pierre Road, just off M-22, and the loop is marked with map posts in a clockwise direction. The main loop measures 9.9 miles while Chestnut Trail is a cross-over spur that reduces the ride to 2.1 miles. Dry Hill, which lies between the Herring Lakes to the north and the Lake Arcadia watershed to the south, picked up its name when early farmers discovered it was too high above the water table to drill a well. Eventually, more advanced techniques allowed deeper wells to be drilled and the flatter areas on top were farmed. Dry Hill winds through a half-dozen meadows and a hardwood forest of predominately sugar maple and American beech, making it a stunning ride in the fall. 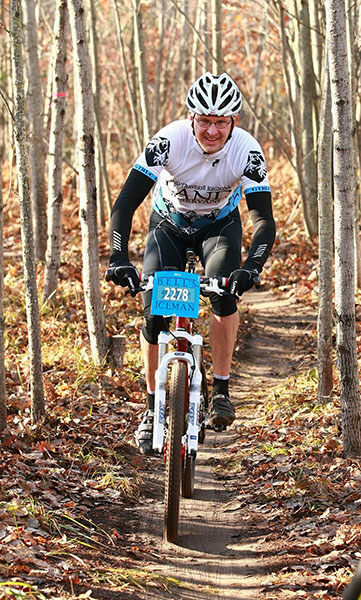 If riding in a clockwise direction, the first half from the St. Pierre Road trailhead is often tight and technical in the woods while the second half is more flowing, including a 1.6-mile long downhill run after the trail tops off above 1,000 feet. Hikers also enjoy the trail. If the nearly 10-mile loop is too much, you can spot a car at a small parking area near where Dry Hill crosses Taylor Road and a second vehicle where it crosses Matzinger Road, a mile before the Saint Pierre trailhead. That would make for a 4-mile trek along what many consider the most beautiful section of the loop. Mountain bikers, especially beginners, looking for a flatter, easier ride should consider Camp Trail, which also departs from the Saint Pierre Trailhead. Built in 2014, Camp Trail is a 3.7-mile loop mostly west of Saint Pierre Road. From the parking area along St. Pierre Road, the trail quickly arrives at the first junction and posted map. Head north (left) to follow the loop in a clockwise direction. You enter the forest and within a half mile cross an old two-track and then climb one of the steeper hills of the day, arriving at map post No. 2 at Mile 0.9, the first junction with Chestnut Trail. Continue east (left) to continue with the Dry Hill Loop. The climbing continues past the junction for another quarter mile until you near 1,033 feet in elevation, Dry Hill’s high point. A rapid descent follows and then the trail follows a pattern of quick dips in and out of the ravines along the northern edge of the moraine through Mile 3. Depending on the season, there are often quick views of orchards along the hillsides, vehicles rumbling by on Joyfield Road and even a brief glimpse of Upper Herring Lake. Just beyond Mile 4 the trail swings south and climbs sharply before topping off at 1,013 feet. A nearly mile-long long downhill run follows, descending more than 70 feet until you pop out at intersection of Taylor and Letteau Roads at Mile 5.3. Just to the west on the south side of Taylor Road is a small trailhead parking area. After crossing Taylor Road the trail climbs a small knob and then curves back to descend its south side, only to bottom out in a meadow and immediately begin climbing again. This time you reach an elevation of 973 feet and then embark on a fast, winding downhill run to map post No. 4 at Zilch Road, reached at Mile 6.7. On the west side of Zilch Road the trail resumes climbing. This time it’s a long steady ascent that at Mile 7.5 tops off at 1,023 feet, the high point of the second half of the loop. Mountain bikers are well reward for the uphill effort as from there it’s a fun ride downhill along a single track that occasionally dips and climbs along a ridge past small wooded hollows and ravines. Along the way you pass a physical milepost near Mile 8. This downhill run continues for 1.6 miles until you suddenly pop out at Matzinger Road. The dirt road appears so unexpectedly that caution is needed to avoid flying across it without first checking for oncoming traffic. On the north side of at Matzinger Road is map post No. 5 and the second junction with the Chestnut Trail. Head left at the junction and the trail makes one more long climb before heading downhill almost all the way to the St. Pierre Road trailhead, reaching it at Mile 9.9. At the trailhead there is parking and an information kiosks but no toilets or drinking water. There is are no vehicle entry fees at Arcadia Dunes. The nature preserve is open year-round. To reach the Saint Pierre Trailhead for Dry Hill Trails turn onto Saint Pierre Road. 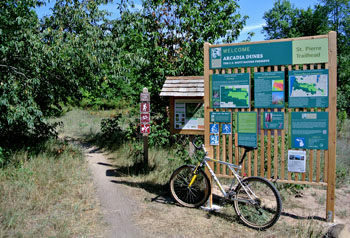 The trail is posted along M-22 a quarter mile south of Joyfield Road. The parking lot is 100 yards south along Saint Pierre Road, a gravel road. Contact the Grand Traverse Regional Land Conservancy at (231) 929-7911 or online at www.gtrlc.org.